Much of today’s data is stored on spinning disks. 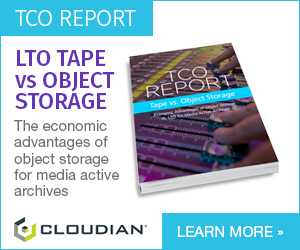 Increasingly, new solid-state storage platforms are being used. The whole edifice of digital recording is based on the concept of a small and integer number of states. 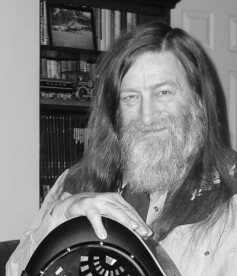 John Watkinson looks at digital media. In most digital media, two states are recorded and the system is called binary, but other numbers of states are used, leading to the general term m-ary. Limited numbers of states have interesting properties that are in the realm of pure mathematics. There is the unusual characteristic that all properties can fully be predicted with the use of pure logic alone and no experiments need be carried out to confirm them. In that respect they are more philosophical than scientific. In the general case, at the level of the medium, the concept of a discrete recording does not exist. When read, the medium, whatever it is, will produce some sort of signal or waveform that is variable. It is the way in which the waveform is interpreted that matters. Digital systems make discrete decisions about the level replay signal by quantizing it. Media that are scanned, such as discs and tapes, require the continuous output signal to be sampled, whereas in media such as RAM and flash memory the symbols are already discrete. At one time it was common to record time code on a spare track of an analog audio recorder. The recorder and medium did not know that discrete decisions were taking place in the time code reader. In continuously variable systems the replayed signal has a signal-to-noise ratio. In binary or m-ary logic there can be no noise, and the effect of quantizing a signal having finite SNR is that some of the discrete decisions will be incorrect. It is a characteristic of all discrete systems that there is a finite probability of some symbols being in error, which means they are in the wrong discrete state. Fortunately it is another characteristic of discrete systems that errors are also discrete and so can readily be located. There are three major categories of recording media; those that rely on physical properties, including magnetism; those that rely on optical contrast and those which use electronic charge. It is tedious to attempt strict categorisation as there is a degree of overlap. Figure.1 shows the basics. Figure 1. Properties that are useful for making a recording can be divided into physical, optical and electronic, but some media fall into more than one category. For example the Compact Disc (shaded) is a mechanical medium that is read optically using phase contrast. The first machine-readable media were necessarily mechanical as they pre-dated electricity. Music boxes, street organs and knitting machines were controlled (today we would say programmed) by the presence or absence of holes punched in card or thin metal. The holes would allow a flow of compressed air or could be detected by mechanical feelers. That technology was adopted in early telegraphy and computing equipment in the form of punched paper tape and Hollerith’s punched cards. Later the holes could be detected optically. Later still holes were created by melting; with the heat from a laser. None of these media could be erased or re-written and when such media emerged a term had to be found for earlier media that were labeled write-once-read-many (WORM) in the case or disks. The electronic equivalent was called read only memory (ROM). The permanence of write-once media has applications in archiving, audit trails and for legal purposes. An operating system held in ROM cannot be corrupted accidentally or by a virus. It was the development of magnetic media that really got data storage kick started as magnetism allows erasure and re-recording, without which data processing would be impossible. Magnetism creates fields that can extend some distance from the source. The source of a magnetic field is always a spinning electron, whether trapped in an atom belonging to a permanent magnet, or flowing in a wire. In atoms, electrons in pairs always cancel out one another’s magnetism. However, certain elements and compounds, which we call ferrous, have an odd number of electrons and the cancelling fails. The energy of a spinning electron is subject to quantum physics, which itself is discrete, so the electron either has to stay put for ever, or shift to another energy state by absorbing or emitting a photon. What this means is that atoms can’t run down, ever. In the larger sense, this is just as well, as without matter there would be nothing to write about, with, on or to. In the smaller sense, this means that magnetism really can be permanent. The spin in ferrous materials can’t stop, so the only way a ferrous material can appear to be demagnetized is if the spins are on different axes so the average spin is zero. Figure. 2 shows that adjacent atoms tend to align their spin with that of their neighbours to produce a region called a domain, in which all the spins point the same way like sunflowers. Why am I going in to such detail? Simply because domains have hysteresis; their present state depends not just on conditions now, but also on conditions that have applied in the past. This is the definition of memory. Figure 2. 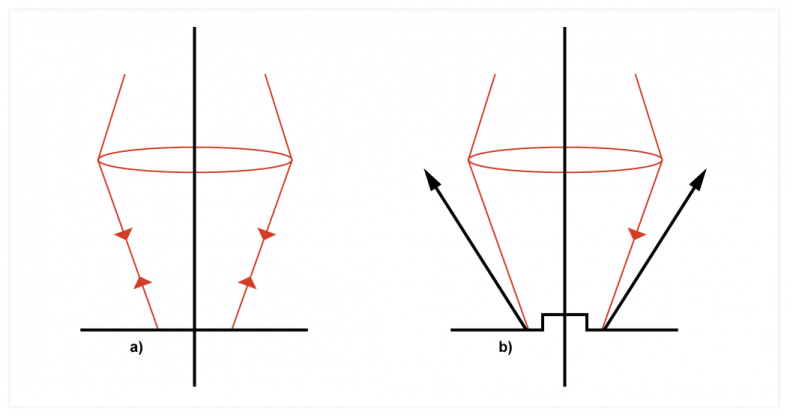 Magnetism results from electron spin and spin has angular momentum. It therefore requires energy to move a domain wall. Lacking that energy, the walls remember their position. The hysteresis of magnetic media causes distortion in any attempt at linear recording, and this led to the development of bias in audio recorders. Hysteresis on the other hand actually augments binary recording and bias is unnecessary. An applied field that is powerful enough will shift one or more domains into alignment. When the field is removed, the alignment is remembered. Magnetic recordings can be made by impressing the field from current changing in a wire onto a medium. The medium can be static, as in the case of magnetic core memories, or it can be scanned, as in disks and tapes. Once ubiquitous, magnetic core memories are largely obsolete, but they still have application in systems that need to work in the presence of ionizing radiation. Spin has angular momentum, so it takes energy to change it. The energy in matter rises with temperature and all ferrous materials have what is know as the Curie temperature, above which the angular momentum of spin is exceeded by thermal energy and the atom demagnetizes. Once the temperature falls again, the ferrous material will align to any applied field. This is the basis of thermo-magnetic recording, where parts of the medium are selectively heated above their Curie temperature by laser and align to an applied field as they cool. Periodically the Earth’s magnetic field reverses. Lava from volcanoes is above its Curie temperature, so successive eruptions create a magnetic recording of the history of the Earth’s magnetism over millions of years that can be read today. An electric current can give rise to a magnetic field, whereas changing magnetic fields can induce currents. This duality allows us to write and read back magnetically stored data inductively. However, inductive playback is giving way to magneto-resistive read heads. In magneto-resistivity, electrical resistance changes according to the direction of an applied magnetic field. The Nobel-Prize-winning discovery of giant magneto-resistance meant that the size of a magnetic domain on a storage medium could be reduced dramatically yet it could still be detected. Many hard drives today use an inductive write head combined with GMR reading. Optical media operate by changing some characteristic of the light returning to a pickup. The most common systems change the intensity of the light using diffraction. Optical discs such as CD, DVD and Blu-Ray all operate on the principle of Figure 3. The discs all have flat surfaces that are modulated by the presence of bumps, or pits. Figure 3. In the presence of a flat surface (a), light from the pickup retraces its path. In the presence of a diffracting object (b), the light is directed outside the aperture of the lens, which is interpreted as the medium being dark. Optical systems act like spatial filters, meaning that low spatial frequencies, carrying average brightness, travel along the optical axis through the centre of lenses. As spatial frequency rises, the information moves towards the perimeter of the lens. The resolution limit is reached when the full aperture of the lens is employed. Optical discs have features that are beyond the resolution of the optical system. As Figure 3 shows, when light from the pickup falls on a flat part of the disc, it is reflected back. However, when it falls on the fine detail of a pit, it is diffracted outside the aperture of the pick-up lens, so the pick-up sees a lack of returning light. Artificial contrast of this kind, caused by diffraction, is known as phase contrast. Figure 4. According to IDC's latest report on the enterprise storage market, the all-flash array category generated $2.1 billion in sales during the first quarter of 2018. That represents a year-over-year increase of almost 55 percent. Image: Circuit Art Mattend. Interestingly, phase contrast optical discs have only one characteristic, which is their physical shape that causes the diffraction. As it is only their shape that matters, they are in fact mechanical media and it is only the readout that is optical. Such mechanical media are readily mass-replicated by pressing. Clearly re-recording is out of the question. The last major category of data storage devices relies on electronic charge. 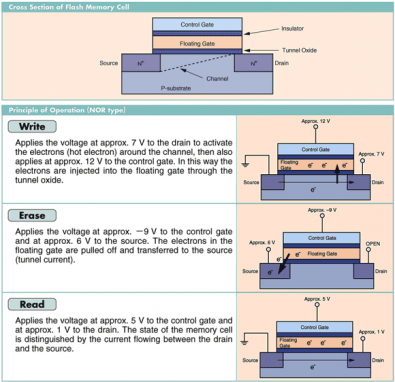 In the so-called flash memory, there are field-effect transistors that have a floating gate. This means it is not connected to anything but is totally surrounded by insulating material. Quantum physics makes the insulation perfect; electrons on the gate can’t move in response to stray voltages when the device isn’t being written. However, very thin insulators display the phenomenon of tunneling. With a higher voltage applied, some electrons get through the insulation, so the charge of the floating gate can be controlled. The charge influences the conductivity of the associated transistor, so it can be read. The first part of this three-part series on data capture can be found at this link.